Baby shower cakes are so fun to make. When my sister-in-law's baby shower was planned, I offered to make the cakes. I say cakes because there were a number of people on the guest list and I knew I would have to make a couple of cake tiers to feed everyone. It ended up being a 3 tier baby shower cake. After I took my cake decorating classes, I tried to practice cake decorating as much as possible. However, a cake for a baby shower is a little intimidating to me. Maybe it is because a lot of people usually attend showers or maybe because the guests were not all going to be family, so they may not be as forgiving of mistakes. But I decided to put my fears aside and make a great cake. I made carrot cake for all three cake tiers with cream cheese frosting. The bottom two tiers were eaten by the guests. The top tier was special. The new mother and father-to-be took the top tier home and froze it with plans to eat it when their son was born. This is a fun tradition I've tried to initiate (similar to freezing the top tier of a wedding cake). The bottom tiers had to be supported with dowels. To support a cake with dowels, measure the height of the cake and cut wooden or plastic dowels to that height. To support the middle cake layer (an 8-inch cake), use 6 dowels. Stick the dowels into the 10-inch cake at the spot the 8-inch cake will sit. Place the middle cake on the bottom cake. Repeat for the 6-inch top layer cake. Use 4 dowels and stick them in the 8-inch cake where the top cake will sit. After setting the top cake in place, measure and cut a dowel that will go through all 3 cake layers. Stick that dowel in for added cake support. Next finish the fondant decorations. The ribbon, bow, shapes and letters were made from fondant. I could have used modeling chocolate since the shower was in January. Whether you use modeling chocolate or fondant, make all decorations at least a week in advance so they have time to dry. I was pleased with how it turned out and received many compliments from the guests. See more baby shower cake photos below. An Adorable Baby Shower Cake? Share it with our cake decorating community! We would love to learn from you. What flavor cake, filling and frosting did you use? Impress us with what you have done! 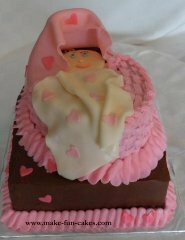 Click on the photos of baby shower cakes for more information. There are many options when it comes to cakes for a baby shower. 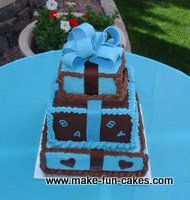 Some mothers-to-be like boy themed cakes with traditional colors of blue or green or girl cakes featuring pink as the dominant color. Other mothers may prefer a gender-neutral cake with gender-neutral color. 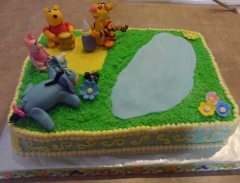 These types of cakes might feature teddy bears, ducks or blocks. If twins or triplets are expected you may decide to do something special on the cake to represent each baby that will be born. Adding a fondant rattle or block to the cake for each child is special, especially if you can add the names to each item. 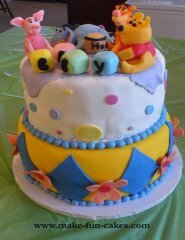 Diaper cakes are also widely seen at baby showers. Free diaper cake instructions can be found on our sister site, Make-Easy-Crafts.com.